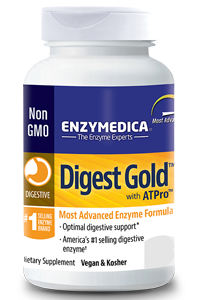 Enzymedica Digest Gold has been formulated to assist with digesting proteins, fats, carbohydrates and fibre. ATPro is an exclusive blend of important nutrients (ATP, magnesium citrate, alpha lipoic acid, CoQ10) that provide ATP production. This co-enzyme is essential for nutrient absorption. Thera-blend enzymes are effective throughout the entire digestive system, ensuring complete digestion. 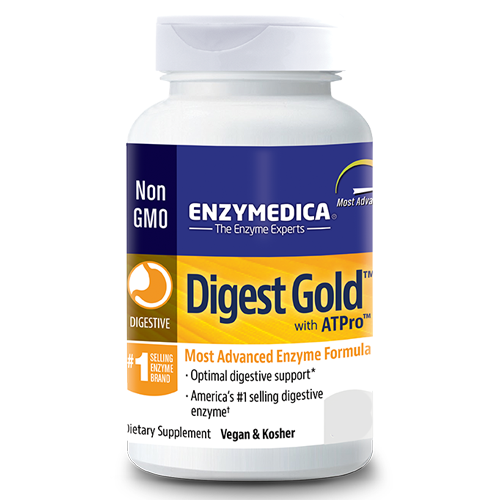 Enzymedica Digest Gold with ATPro is a vegan and kosher food supplement. Contains No egg, dairy, preservatives, salt, sucrose, soy, wheat, yeast, nuts, corn, gluten, casein, potato, rice, artificial colours or flavours.